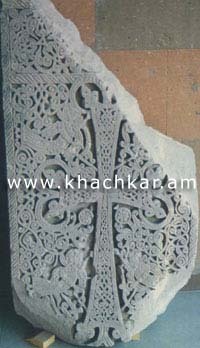 The process of creating a khachkar begins with choosing a type of stone (mine). Usually, local materials were used, and priority was given to yellow-reddish tuff. The ultimate size of the stele is considered important. In the first step, the stele was rendered into certain proportions, such that the narrow sides and surfaces of the future monument were squared and polished. The reverse side, if it wasn�t intended for inscription, was only roughly squared. In the beginning, the components of the future composition were sketched on the gound surface. The creation of complicated and proportional geometric carvings presumes precise measuring with a ruler and compass. Also, different stencils were used. In some cases, carving without sketching was also common. Carving was been done by means of a chisel, a die, sharp pens, and hammers. The main technique of carving was dual crossing, in which two corners of future shape were sketched by two parallel lines and were carved to the imaginary central line. The carvings were ground by fine sand. The small breaks and unsmooth parts that were formed during the carving process were later eliminated by plaster of clay or lime, and then were painted. Special care was required during the transportation and positioning of the stele, which is suggested by the "technical" projections and holes (at the bottom). Examination of several khachkar in situ positions suggests that khachkars were put in place with the help of ropes. In order to erect the khachkar a tail-jut had been inserted into the specially created hole in the pedestal and was strengthened by small stones and mortar. In the process of connection of the tail to the pedestal or the cornice to the stele stone, wooden and iron wedges were also used. The naming of a khachkar after a saint: Holy Godmother, St. Sargis, Gevorg, Poghos, Petros, Stephanos, Hovhannes, Grigor, Qristapor, etc. was a widespread phenomenon. Sometimes the image of the saint was depicted on the khachkar. One of the explanations for this practice is that the person erecting the khachkar was giving his/her namesake Saint's name to the monument. 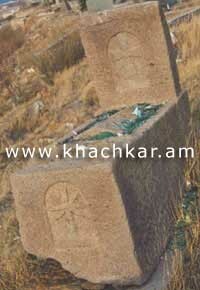 From this kind of khachkars the mediation of both the cross and the saint was expected. The named khachkars bore the features of the cross and the relevant saint. For example, Holy Godmother khachkars granted happiness to families and mothers, St. Gevorg khachkars granted strength and courage to soldiers, etc. e. Religious-mystic events (vision, change of religion, etc.). The parallel examination of khachkar inscriptions with religious-ritualistic texts reveals that there was a specific religious ceremony associated with the placement of a khachkar, which resulted in the blessing of the khachkar (prayer, reading, make the sign of the cross) and anoint ("cleaning" with chrism or water and wine). The basis of the ritual is the Christian perception that an inanimate subject cannot have any power if God is not living in it. Evidence indicates that the right to place a khachkar could be acquired upon payment of a certain fee. It is probable that the ritual expression of such a "contract" was the anointing itself. Particularly interesting is the practice of anointing with wine: in the case of those khachkar on which the "wine-providing" grape rods and pomegranate are required elements of the composition, this practice was viewed as an anointing with the blood of God. Numerous khachkar inscriptions present khachkars as anointed by holy blood. After being blessed and anointed, the khachkar already possessed holy powers, and from that moment forward its holy function could begin, as mentions an inscription on one of the khachkars in Garni from 1216 which states "Lord Jesus on this". The classic khachkar was an individualistic monument. This is one of the main differences between khachkars and other religious-spiritual structures, and this allowed for its mass distribution. At the same time, by virtue of its open air placement and by the invitation to worship the cross, each khachkar was open to any believer. It can be stated that one of the primary features of the khachkar is precisely the assurance of a direct (unmediated) connection of believers with the holy power and its symbol. Study shows that the holy feature of the cross was initially directed towards future, sometimes the near future but mainly the distant future. The cross appeared as a custodian and transmitter, a mediator of remembrance to God, leading and showing the way toward the Second Advent. Thus, the core feature of the cross as mediator between people and God is obvious. The practice of mediation is also realized by the church, saints, various remnants, and the book. But in the list of these mediators, in Armenian Christianity, the cross had been allocated a special position. As a result of the popularization of the cross, the khachkar became the saint that was most approachable and the least demanding in terms of rituals and conventionality. 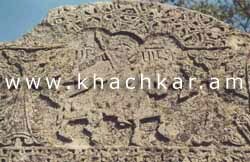 Each khachkar by its very presence, was an indicator, defender, and consecrator of the terrain: this explains the placement of khachkars on crossroads and on the edges of roads, on borders and on hills dominating the terrain, on the rocks and near springs. Thus khachkars also took on purposes that were far from the goals entailed in their erection. Over the course of time and due to various historical and cultural circumstances, the original goal of the khachkar (intended by the erector) could have been forgotten and new goals were ascribed, which helps to explain the purely folk connotations of khachkar and its later uses. Within this folk "classification" the most famous khachkars were those intended for the healing of various sicknesses, especially those that were called "all-savior" , in this case meaning that they could be appealed to during any sickness. In the list of "specialized" khachkars the �blue crosses", "cough crosses", had wide distribution. The other group of khachkars that took on an ascribed feature consisted of the so-called "anger�s crosses", the main feature of which was the prevention of natural disasters. Contemporary ethnographical researches gives a basis to suppose that some khachkars were ascribed the feature of measuring fear. The ascribed features, unlike the anticipated features considered upon the erection of a khachkar, are more single-lined and materialistic. In such instances, the khachkar lost its spiritual and individualistic features and was retaining only a communal or general connotation. In such cases, the decorative composition of the khachkar could not have any other meaning but as a monument of art. In the number of attested names of khachkar masters, khachkars are second only to manuscripts. Prior to the 15th century, masters inscribed their names in concealed places and sometimes hid their names within the decor. In the 15-17th centuries, on the contrary, the names of masters were placed in central sections of the composition. The patrons were also interested in the placement of the names of masters, for this could signal the amount of their efforts, since hiring a famous master involved serious spending. The first reference to a khachkar master is from the 9th century. References become bigger in number in the 13th and 16-17th centuries, which corresponds to the period of the development of khachkars. The masters referred to themselves as sketchers, workers, compilers, inventors, decorators, painters, sculptors, masters, etc. 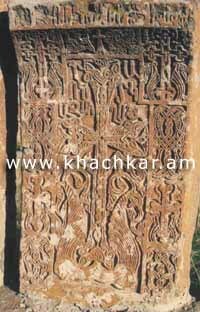 Khachkar creation was a multi-dimensional profession � lying in between architecture and sculpture, given that the creation of each khachkar required not only knowledge and skills of sketching and carving, but also skills in sculpting, architecture, construction, etc. Some famous masters (Vetsik, Khachinek Anetsi, Siranes, Momik) combined all these professions. Evidence is making it possible to infer that khachkar masters, just like other workers in construction, were travelers, and the most famous masters were receiving orders from all over the country. The master often worked with an apprentice; there were also groups of artisans. Most of the masters were secular, but the number of religious masters is not small. There were even bishop-masters; this confirms that the making of a khachkar was a prestigious profession.